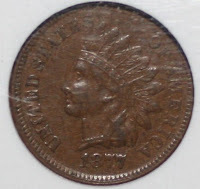 The next coin to talk about is the "1877 Indian Head Penny. Key Date & "how to detect altered and counterfeit coins"
The 1877 indian penny is not the lowest mintage in the series with 852,000. The 1909 s mintage stands at 309,000. The reason that the 1909 s isn't as rare as the 1877, people saved the1909 s because of the advanced awareness of coin collecting and the fact that it was the last mintage of the series. The 1877 is up there with one of the most altered coins. The two most important things to look for are right in the main focal points, as we discussed before in my past blogs. the date. The second "7" is lower then the first, and most counterfiets will display the "7"'s in a line. alot less when he was not here to enjoy them with me. The part is I think of him and feel like he is with me when I'm around coins. So please enjoy them as much as i do. That concludes this blog on "How to detect altered and counterfeit coins". Watch for the next Blog real soon.